The kids love it when books come in the mail for them. They are quite used to the idea of books randomly arriving on our doorstep, but there's a special excitement when I tell them that they can open the package to see what is inside. 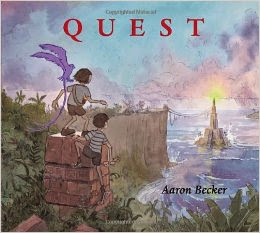 Quest , by Aaron Becker is a notable book this year. I keep seeing it on store bookshelves and was curious. I was delighted when we were given an opportunity by Candlewick Press to look through it. We don't normally go the wordless picture book route so I wasn't entirely sure what the kids would think. I handed it to them one at a time and asked them each what they thought. Each child flipped through the book, and one or two of them confused because there weren't any words! The pictures are interesting through as they show a young boy and girl taking cover under a bridge in the rain. They are surprised when an older fella (magician? wizard?) enters the scene and appears to be sending them on a quest. Of course, you can make up your own story as you turn the pages. Purple and red are the color themes running throughout this book, which both stand out amidst the darker backdrops of oceans, mountains, and castles. Really, I'm not sure what to make of this book because I'm not much of a pictures-without-words sort of reader. But, as I say, each of the kids sat down with it and said that they liked it. Bookworm2 (age 5) was the only one who worked his way slowly through the pages. After each child had a chance to look at it, I put it up on a shelf (where I'd be sure to see it and remember to review it) but I found it spread open on the floor once. That's a good sign. Someone else was also curious. Thanks again to Candlewick Press who sent a copy of the above title my direction in order to facilitate this review. I received no additional compensation for this post and all opinions are my own. 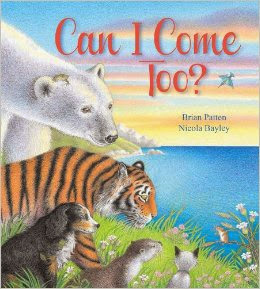 In keeping with the quest/adventure theme we also had the chance to read Can I Come Too? , by Brian Patten. This book is adorable and I loved it. Within these pages we are told the story of a very small mouse who wants to go on an adventure to find the world's largest creature. She sets off to discover what the largest creature is and along the way she makes friends who also want to join her on her explorations. By the end of the story, all of the animals have found the world's largest creature and they all agree that it was the good company of their fellow (smaller) creatures which made the journey worthwhile. The part of this story which I particularly love is the end wherein the mouse curls up to go to sleep and thinks to herself, "I might be tiny, but I've had a very big adventure." Our family likes to go on adventures and we would love to take our kids on any number of them as they grow up. We get mixed reactions when we talk about traveling with our young children. I understand the people who hesitate and wonder whether or not it's a good idea to take kids to different places. It is true that our kids might not remember specific details of trips but, as one friend of mine put it, they will understand that they went on an adventure with their family and every trip builds and solidifies our own family's culture and I do think that is important. Remembering the details are just the bonus points. Even small kids love big adventures and that is an idea which is encouraged and promoted in Can I Come Too? . I can only highly recommend this title. Many thanks to Peachtree Publishers for sending this title in order to facilitate this review. I received no additional compensation for this post and, as always, all opinions are 100% my own. Here, here (hear, hear?) to the adventures, though we currently have a 4 year old who hates, loathes, and despises riding for any distance longer than, say, half a mile, so. . . I've always liked reading about quests even though I wouldn't want to go on any myself. :-) At least not the fraught-with-danger kind in some story books. We did more traveling and doing when the kids were younger, and sadly, Jesse doesn't remember much of it, but it was a family adventure at the time. We can't do much with my m-i-l here. Even though we have a little one in our lives now, I'm holding off on a lot of kids books until he gets a little older and we see what kinds of things he likes. I can see the picture one appealing to certain kids. They both sound good, thanks!